We all love to wear black and white, but in the summer these colors can be hard to style together. This post is all about how to wear a black and white summer outfit. I know you have been following around my travels in the PNW. You’ve probably noticed that I’ve really only shared the nature and gardens I’ve visited. 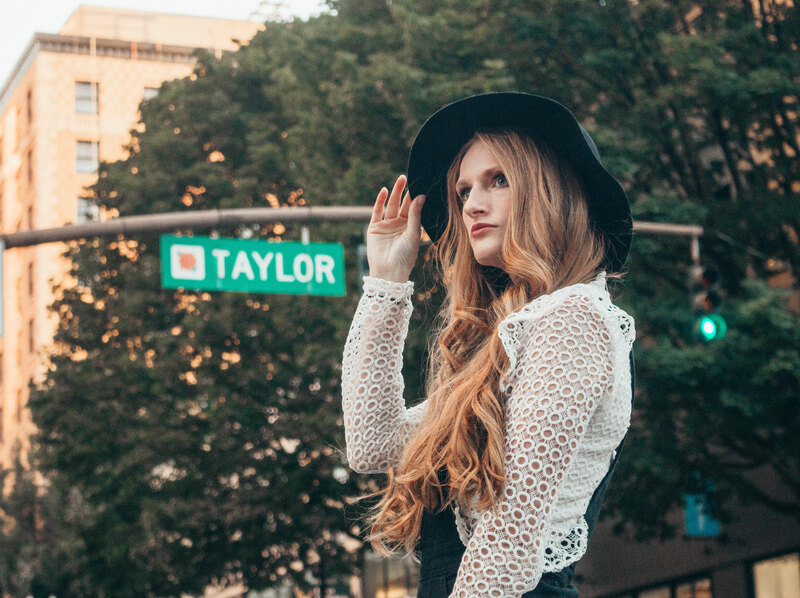 Well in this post I’m bringing you to the streets of Portland! This is such a vibrant city, and it reminds me of where I grew up in Cambridge, MA. There are so many things to do, so many places to eat, and so many things to see. I love that I can get a big city feel, while living in the outskirts in Washington. It only takes 20 minutes to get from my house to Portland. 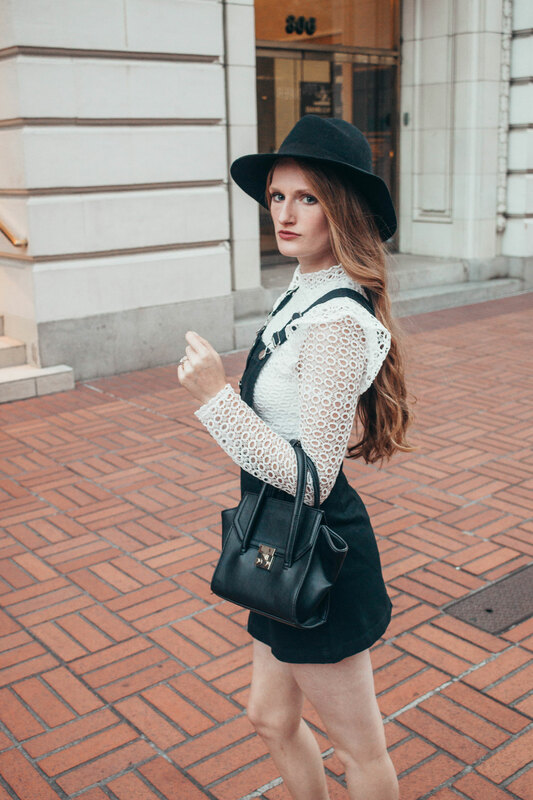 This white and black summer outfit is super easy to replicate. I’ve included tons of similar options for you to combine. 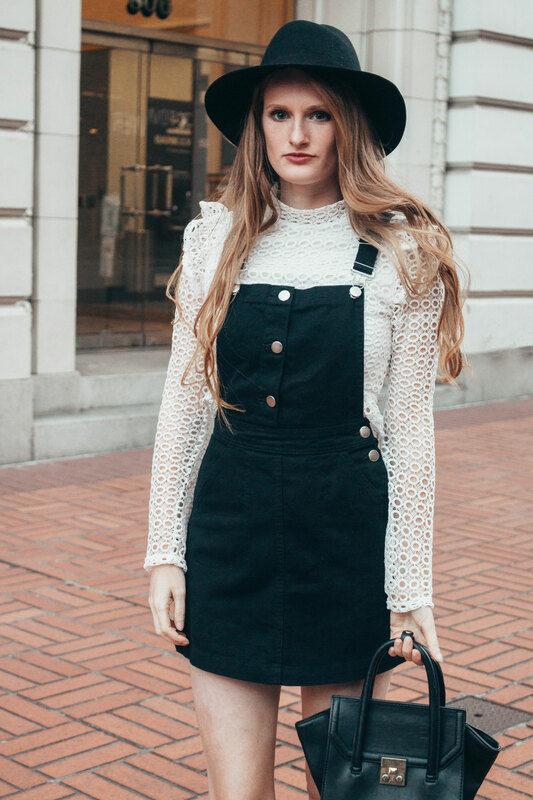 Styling an overall skirt is so fun, you can wear long sleeves, short sleeves, or lights sweaters underneath. This one fits so perfectly, and looks so cute with this white lace top underneath. I also styled this overall skirt in this tulip field post, and my top in this Clarins lipstick post. I like the colorblocking aspect of this outfit. Each piece of clothing is easily identifiable. THe contrast of the white top under the black overalls looks so sophisticated. 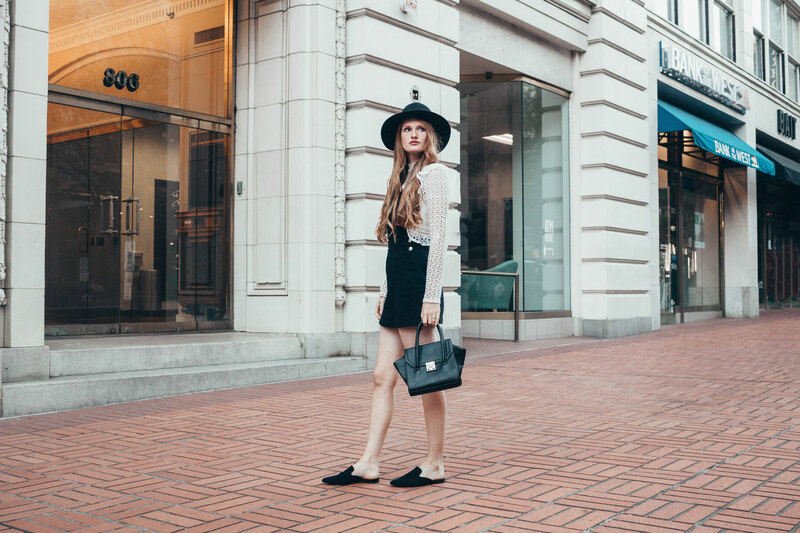 I styled my outfit with black accessories, like a black minibag, my mule shoes, and my hat. I think the hat really pulls the outfit together. 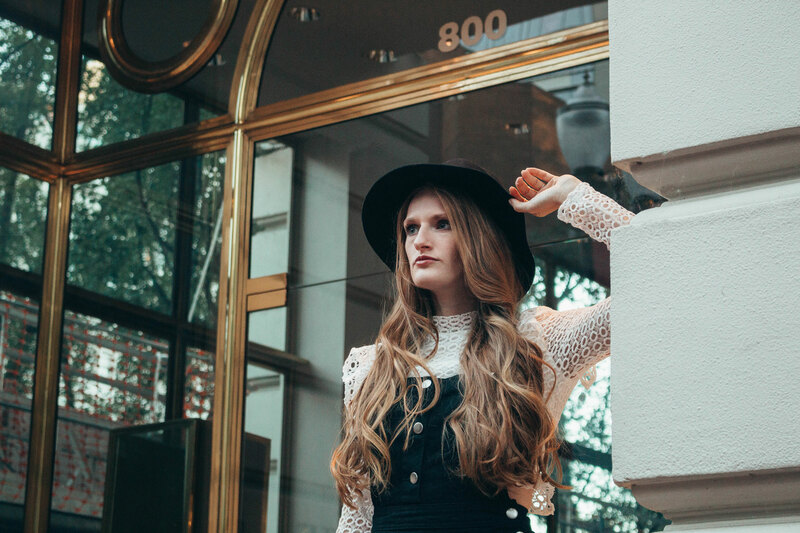 Hats are the perfect staple during the summer and fall, I think they add so much sense of style to outfits that would otherwise be basic. The Australian brand Lack of Color is one of my favorite places to shop for really cute hats. Accessories are a great way to add matching colors to your outfit. Here I stuck with all black to play around the overalls. See, it’s not too hard to style a black and white summer outfit! Since it’s so hot I would stay away from a completely black look. The lace long sleeve adds some air flow into your outfit, so it’s not like you’ll be sweating through thick fabric all day. Adding contrasting details such as a white top with a black skirt can make your outfit look more summery. White means summer, and black means chic. Together they make one of the prettiest outfit combinations that you can style in the summer. All the while looking like you’re living on 5th Ave in Manhattan. Okayyyy this look is SO CHIC. I seriously wish I could pull off something this cool – you. look amazing! THIS IS SUCH A CUTE LOOK! I’M NOT ONE TO USUALLY GO FOR BLACK + WHITE BUT I WOULD TOTALLY WEAR THIS WHOLE OUTFIT. Cute outfit I love how you styled it! The details on your shirt are so pretty! I am loving this look! I agree no all black looks, it’s just way too hot for that. I love the shirt! You can never go wrong with black-and-white.. Love how you styled it! This is such a cute outfit! Love that top, so pretty! Omg your pinafore dress is everything! 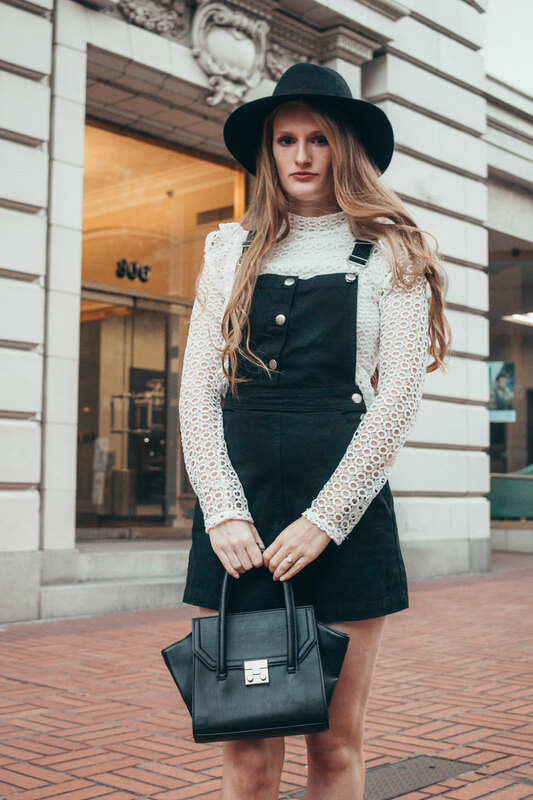 Love your black and white combo! So chic and sophisticated. Absolutely love this — it’s so super chic and totally perfect for summer, too! This outfit is so cute! I love that white top underneath you dress! Love this outfit! So chic and fun! Beautiful and youth outfit! 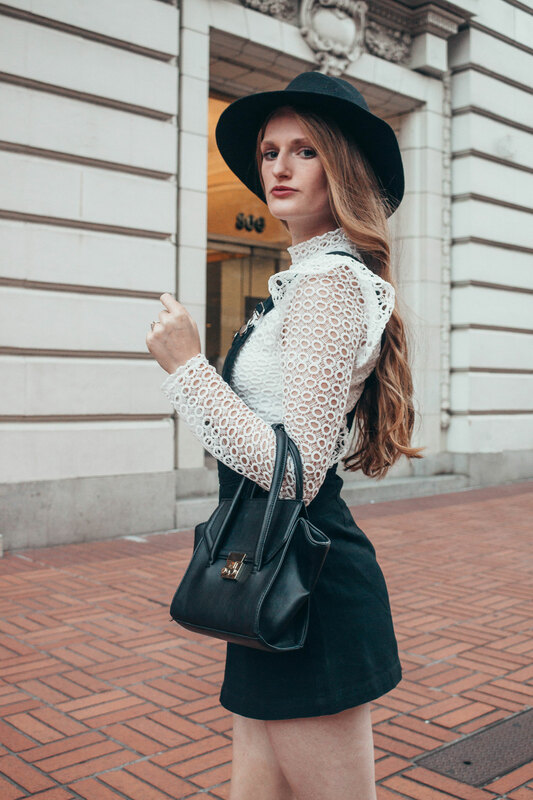 I love the lace blouse, perfect combo white and black..
Love this look! Great tips too!